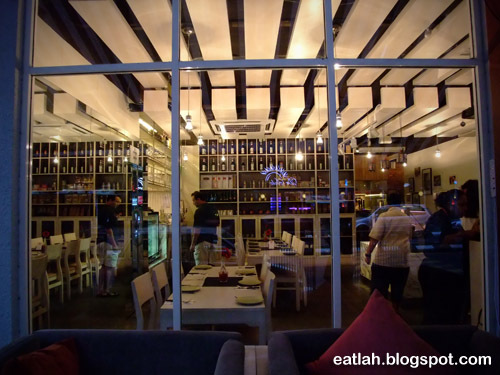 MeatWorks @ Solaris Mont Kiara, KL | where and what to eat lah? 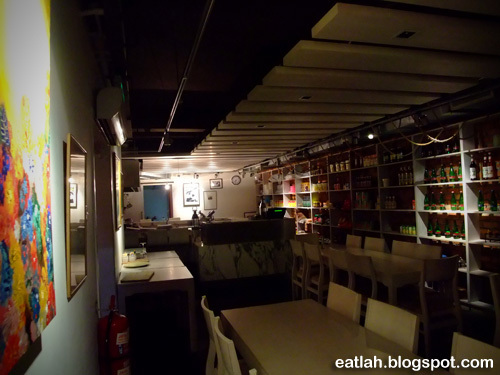 Meatworks is a unique concept restaurant blending a full-blown Restaurant, Butchery, Deli and MeatStudio under a single roof. 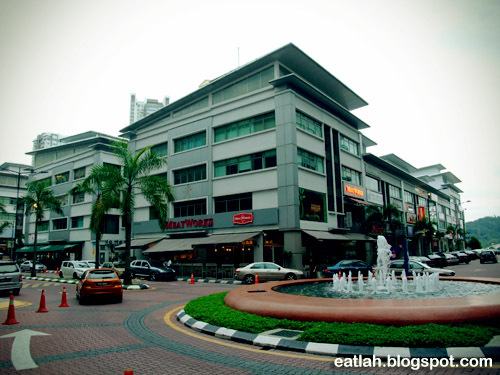 MeatWorks opened its door in May this year and located in Solaris Mont Kiara, just directly across of Cold Storage. Run by a very young team headed by executive director Izzana Salleh, 23, who is also an executive director of the National Feedlot Corporation (NFC) - an element of the Ninth Malaysia Plan, the NFC was part of the solution to address the food crisis, especially the shortage of beef in the country. With their farm located in Gemas, Negeri Sembilan, it is a farm to fork business. 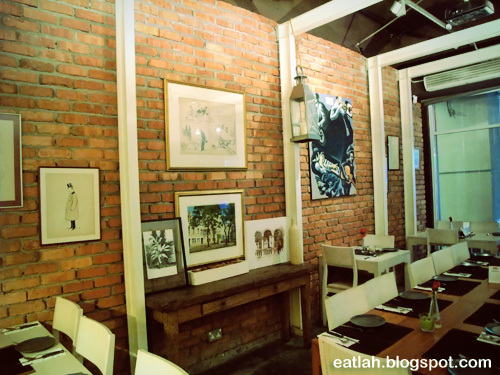 The interior of the restaurant was very inviting, it was all cozy, classic looking with orange rustic brick wall filled with vintage artworks framed and hung along the wall. 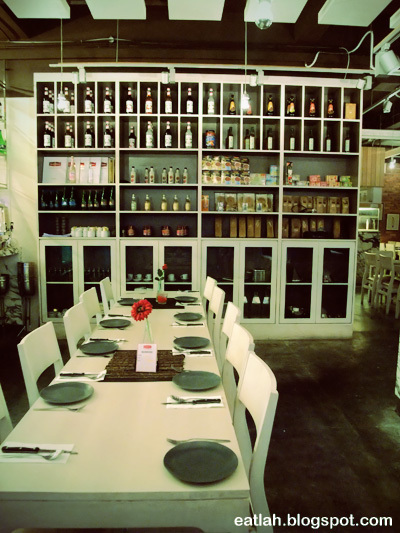 Stacked on a double storey shop, MeatWorks has a seating capacity of up to 200. 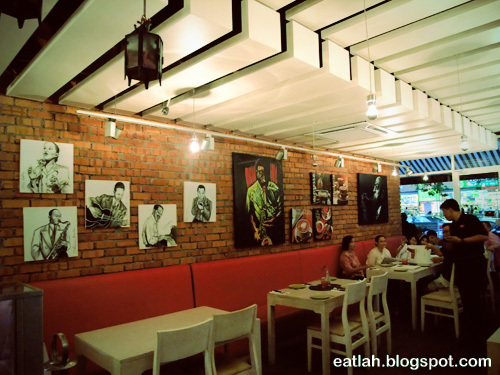 Meatworks is a totally 100% halal joint, not even a single drip of alcohol in their menu. You must be wondering, serving quality steaks but without red wine?! No worries though, Cold Storage is just across the street, you can bring in your own alcohol with a RM 10/bottle corkage charge. On the first floor, you'll have the Meat Studio and the open terrace Deli - perfect place for cozy private functions and cooking classes with MeatWorks professional chefs. It's all about freshness. Walk into this beeftopia and be spoilt for the choices of fresh and aged meat at their Butchery section, all made and bred locally within Malaysia. Going through the full halal MeatWorks menu. As you can see from their menu, no alcohol drinks served, instead of Bloody Mary, you'll have the Virgin Mary. Their drinks are pretty expensive and we didn't know they do serve complimentary drinking water. 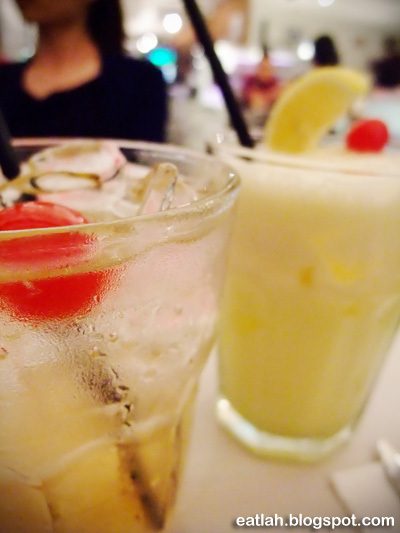 We ended up with the peach syrup (RM 10.50), basically made of peach syrup and soda water, and Virgin Pina Colada (RM 15), it tasted weird without Malibu. 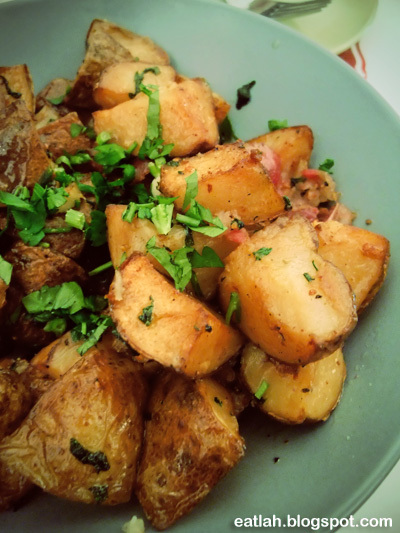 Fondant potatoes (RM 12), sautéed unpeeled potato wedges with corned beef silverside. 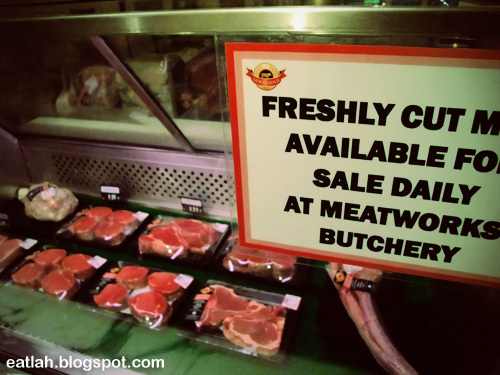 I just can't imagine visiting MeatWorks and not having beef steak at all. Ain't happening to me for sure! 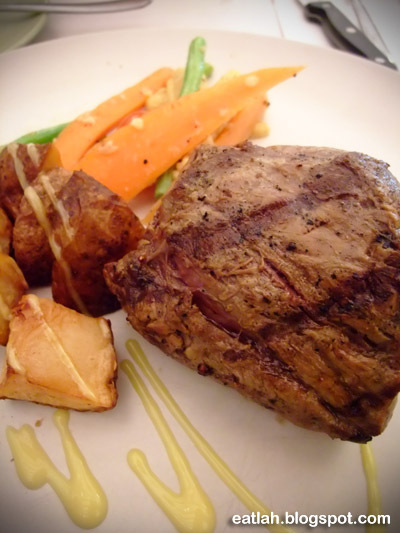 The waitress recommended us the beef fillet 220g (RM 59), apparently it's the most tender cut of the beef. I was disappointed for not getting the creamed potato mash as shown in their menu, gotten sick of the same potato wedges again. 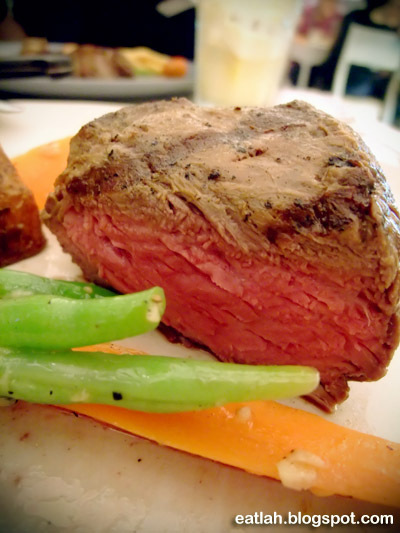 Perfect beef fillet cooked to medium doneness, it was indeed very tender, pinkish and juicy! Lightly seasoned with brown sauce served on the side, a good steak like this doesn't need to be drowned in sauce. 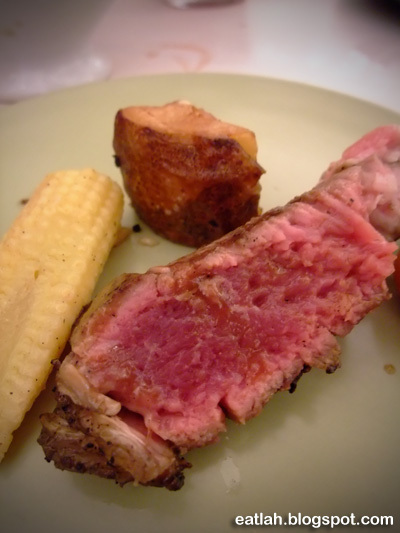 However, some might think it's bland without the sauce, but a good steak is actually best taken without any sauce, so you can actually savor the taste of the meat. 4 racks of milk-fed lamb (RM 55), a young lamb typically 4 to 6 weeks old, fed only on their mother's milk before ended up on this plate. 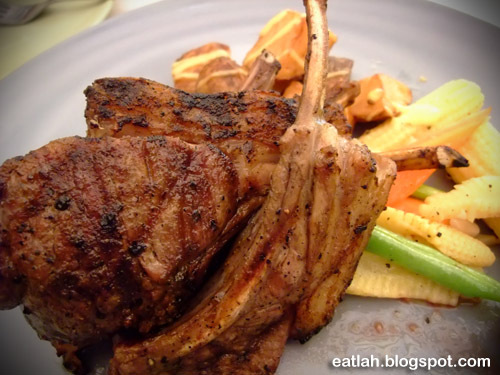 The flavor and texture of milk-fed lamb is generally much finer and tender than the older lamb. You don't really get much lamb flavor from this young lamb, whereas when the sheep ages the meat becomes tougher and stronger in flavor. Most people don't like the strong, gamy flavor, but I do! It caught me off guard when the waitress asked for the lamb's doneness, do people actually eat medium-rare lamb? Anyway, I requested it to be medium-well, but somehow, it ended up looking pretty rare to me. It was barely tasteful, felt like there wasn't any seasonings or marination at all, either that or it was meant to be cooked this way? 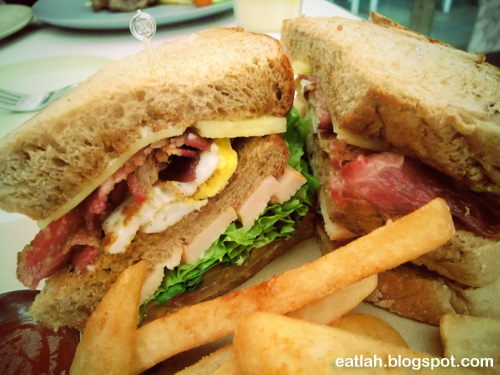 For something a little less meaty, you'll have few choices of sandwiches to pick from. 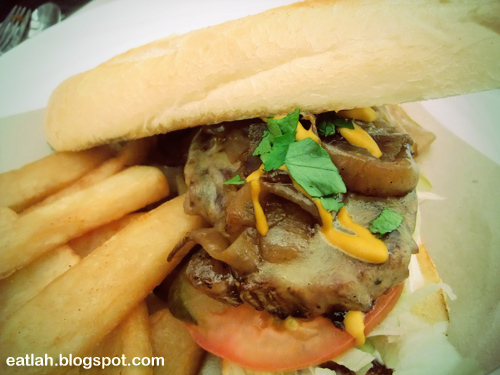 One of it, Philly cheese steak sandwich (RM 24), with thin slices of sirloin steak topped with melted cheese, caramelized onions and wrapped in a soft sandwich bun. MeatWorks club sandwich (RM 25), with layers of smoked chicken and seared corned silverside topped with age cheddar, Philadelphia creamed cheese, jalapeños, a fried egg and tomato slices. Verdict: Expensive! Don't bother at all, if you're not a meat/beef lovers or if you're into strong tasting food. Most of the meats we had were cooked with very very light seasoning and marination (or maybe non at all!). Probably so that you can actually savor the taste of the meat (I guessed!). However, I do like their concept of selling fresh halal cut meats, all made and bred locally within Malaysia, I'm sure this will be a popular place for the wealthy Muslim. So, support lah the Malaysian cows! My family and I used to eat there since it opened, it used to be decent but the standard has recently fallen very low. Customer service was bad too. When we sent a piece of meat back because it smelled and tasted terrible. The supervisor sent it back to our table and told us there was nothing wrong with it and no one else had a complaint. It was something we had ordered before so we knew it wasn't supposed to taste like that.